You've got the cap and gown on order, but what about the all-important ensemble to sit under the traditional garms? Forget that tough dissertation; this is where the real hard work begins. It’s no mean feat finding something that looks just as good swamped in big Dickensian layers as it will do hours later when it's time to celebrate in your favourite pub. However, let's take a moment to look at a few of the key positives before we begin on this fashion education: Black goes with everything, everyone else in the same boat and you won't be in the actual cape for that long. This is a moment where endless photographs are taken (thanks, family members!) and memories are set in stone. You'll look back at these shots forever, and we're pretty sure it's comforting to know that you made an effort during what is undoubtedly one of the most important days of your life. As with all big occasions, there are dos and don'ts (really high heels have to be cast aside, white dresses could easily have coffee spilt on them, and so on), as well as a fine line between your personal style and what's required of you. 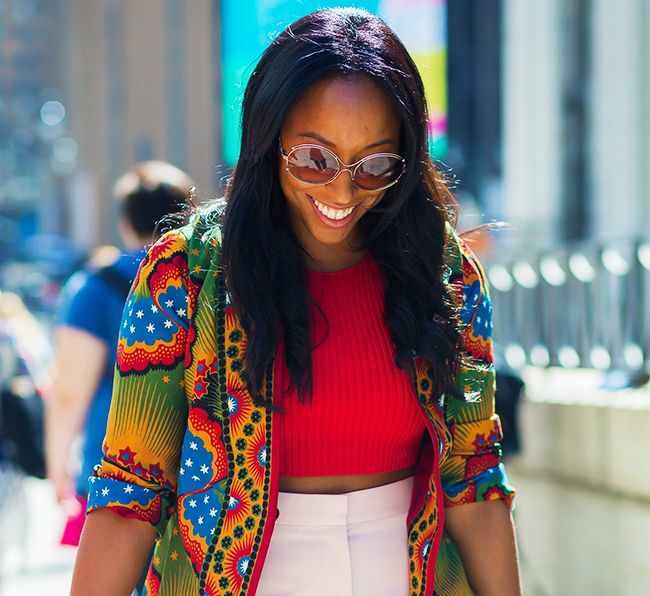 Shiona Turini, an always-slick fashion editor, knows that tailoring doesn't to be bland. So what exactly is and isn't acceptable? How dressy is too dressy? Can you wear something that will stand out in photographs, or is it wiser to play it safe? All very real concerns when shopping for such a momentous do. As ever, we’re here to provide practical shopping inspiration, and we've found some perfect looks to steal, courtesy of the street style set. Goodness knows what they wore for their own big days, but these easy-to-copy looks guarantee you'll be memorable for all the right reasons. Scroll down to see (and shop) six pitch-perfect graduation outfit ideas and be the best dressed in your year. Style Notes: This look tells us you can do grown-up ceremony-appropriate dressing without compromising on the fun. Take your cue from Aimee Song, who mastered clashing prints like a true pro, artfully combining two contrasting patterns in the same colour palette. Whip off the cloak, and that short hemline will spell out P.A.R.T.Y. while the sensible shoes will keep you on your feet for hours to come. Style Notes: In case you didn't know, printed trousers are still a hot-ticket item, and such smartness translates perfectly to graduation dressing. Let the focus be on the power piece and balance your look with a blue poplin blouse. As for finishing touches, we think block heels are the perfect preppy companion for this outfit. Style Notes: It'll come as no surprise that we believe florals to be a wise choice when it comes to occasion dressing. Zara's take on the new-season midi dress is perfect for graduation, thanks to that sensible hemline, high neckline and purse-friendly price tag. Plus, it's anything but boring, and like most fancy floral frocks, it's one you can wear again and again. Just add trainers and a khaki utility jacket for the ultimate off-duty look another day. Style Notes: Not everyone has a fashion-forward approach to event dressing, and that's no bad thing. If punchy prints and bold colours are just not your thing, there's always a low-key way to nail your look. We're looking to Julie Pelipas, who chose neutral tones and understated accessories for a recent winning ensemble. To avoid looking too underdressed, slip into the shoe of-the-moment (bravo, Charles & Keith), and complete your outfit with a pair of statement earrings. Style Notes: We've said it before, and we'll say it again: There's nothing staid about suiting. Silky, pajama-style tailoring is our favourite way to wear the trend now, and one or two high-shine accessories will take your look seamlessly from day to night. Style Notes: Even if you're a Gen Z grad, you can't go far wrong with millennial pink. It's long been around, and we're every bit as surprised as you are that it's still very much the look du jour. Block heel sandals will stay comfortable for the long haul and a white shirt always looks the business. Next up, 10 sandals to see you through an entire wedding season.